Former Ambassador to the UN warns Obama not to take any actions before leaving office that could hurt Israel at the UN. Former U.S. Ambassador to the United Nations John Bolton on Sunday warned that President Barack Obama should not take any actions before leaving office that could hurt Israel at the UN. Speaking in a radio interview with host John Catsimatidis and quoted by The Hill, Bolton said that there is "a lot of speculation over in Turtle Bay at UN headquarters about resolutions that recognize a Palestinian state or that try and set a boundary for Israel based on the 1967 ceasefire lines." "I think that’d be very inadvisable for the president to do that," he added. The Palestinian Authority (PA) has in recent years several times initiated unilateral resolutions at the UN Security Council which seek to condemn Israel over its construction in Judea and Samaria and force a peace settlement on the Jewish state. There have been concerns that Obama, freed of re-election concerns, will advance such resolutions or break with American protocol and refrain from vetoing them if they are voted upon before he leaves office. A group of 88 senators recently urged Obama to continue to maintain the long-standing U.S. policy of vetoing one-sided UN resolutions on the Israeli-Palestinian Arab issue. In his comments Sunday, Bolton said that President-elect Donald Trump's transition team is "doing an excellent job," noting that Trump has spoken with various world leaders who have congratulated him on winning the election. “They’re obviously very, very interested in finding out more about him, more about what his administration’s priorities are going to be,” said Bolton, who is reportedly being considered by Trump for the position of secretary of state. "I think part of the uncertainty that people feel is that they know that America's foreign policy is going to change. That's what democracy does. You get new leaders and the country moves in a different direction," he added, according to The Hill. 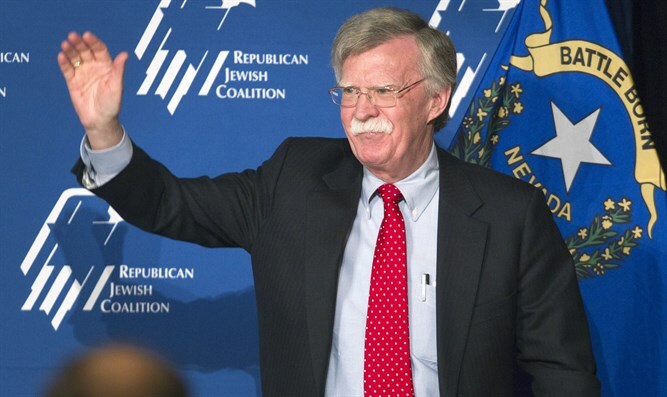 Bolton is a staunch supporter of Israel and has spoken out against the nuclear deal with Iran.